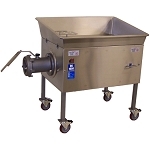 Manual feed meat grinders in both tabletop and floor models from Daniels Food Equipment and Pro-Cut. We have manual feed meat grinders in both tabletop and floor models from Daniels Food Equipment and Pro-Cut. Many of the tabletop units are ideal for home use by hunters and game processors.